While learning may be one of the most natural acts in the world, it is not always clear what path teachers should take to impact student’s the most. 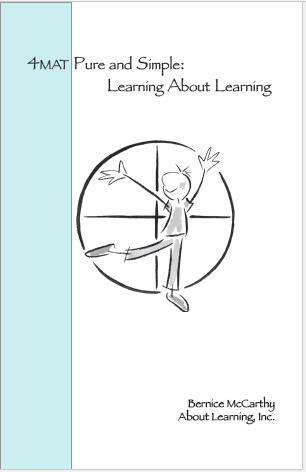 So, if you want practical guidelines for improving the dynamics of learning, this simple book will show you the way. 4MAT Pure and Simple: Learning About Learning will introduce one of the most widely used learning frameworks in the world. It includes an open-ended process for understanding and improving the dynamics of learning. It also reveals the different journeys people take along the way and how to cultivate a fuller range of learning skills in the classroom. One aspect of the 4MAT Model is its use of right and left mode teaching methods. The 4MAT Design encourages teachers to alternate between using both types of methods to ensure high levels of student involvement and engagement. Download our Right Mode Teaching Checker to assess how well you are tapping into both the analytical (left mode) and intuitive (right mode) aspects of student learning.